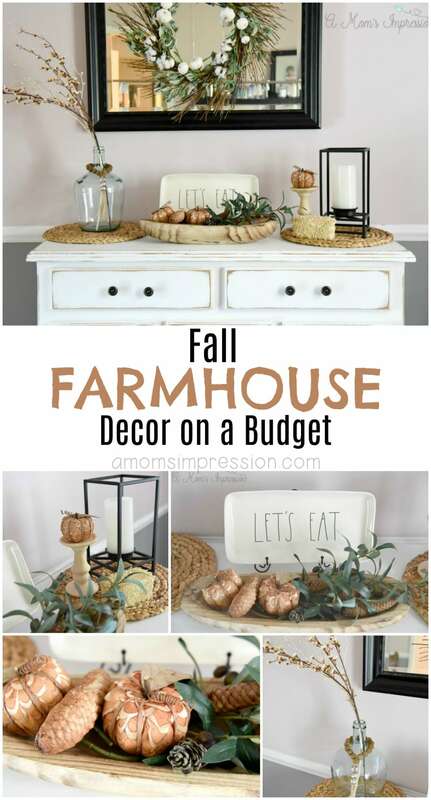 We partnered with At Home for this sponsored post, Fall Farmhouse Decor on a Budget. All opinions are mine. I love the change in seasons, it gives me the opportunity to change up my home’s decor. Fall is especially a fun season because of Halloween, Thanksgiving and the promise of Christmas! 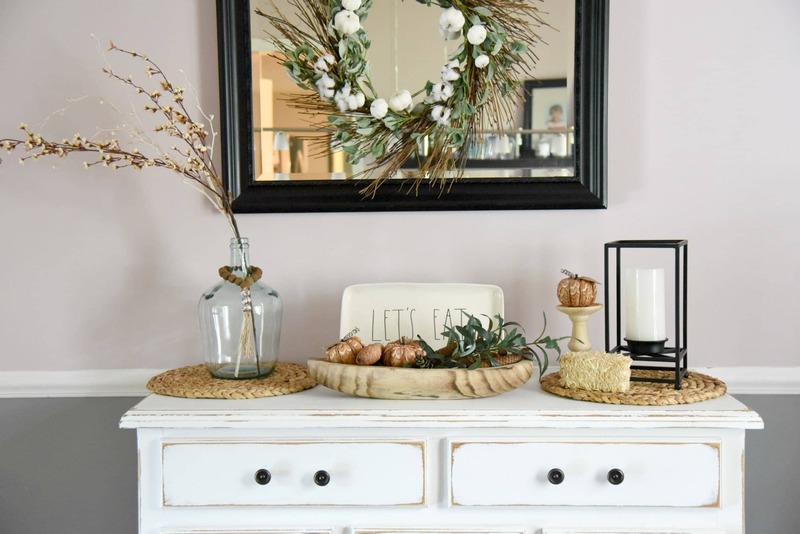 This year is even more exciting because we are finally at that point where we are adding some new furniture to our home like the console table at the front door and our new to us buffet in the dining room. As you can see, its really boring and has no decor. I just happened to but some random things I had around the house on it. I knew it needed some sprucing up for the season, but the problem is that my husband has put me on a tight budget. I didn’t need to worry because for about $100 I made it look amazing! My secret was shopping at one of my favorite home stores, At Home. At Home provides a full solution for all of your home decorating needs, with a massive selection of specialty products for seasonal entertaining. What is even better is that their everyday low prices let you decorate on a budget. 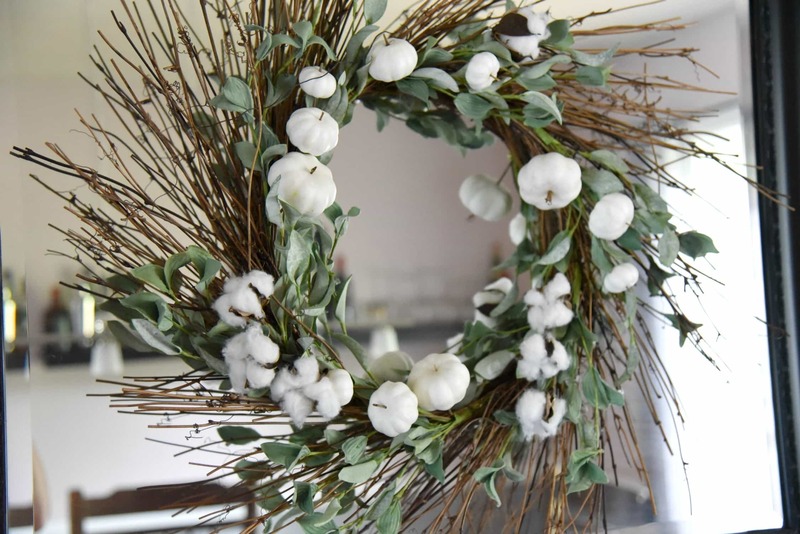 I think my favorite find is this pumpkin/cotton farmhouse style wreath that was under $30. It was the statement piece that my dining room desperately needed. The pumpkins let you know its fall without screaming pumpkin patch. It is a nice complement to the rest of the decor in the room. Another favorite find was this dough bowl that I just had to have. It was also under $20 and I know I can use it for every season. 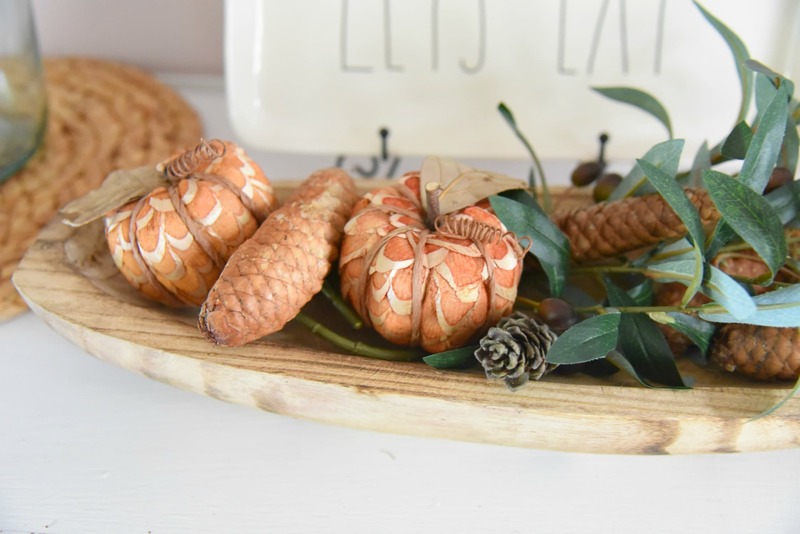 For fall I placed these adorable pumpkins that I found in the seasonal display in my At Home store along with some pinecones that my daughter and I picked up outside in the yard. I love doing fun scavengening when decorating on a budget. I added some greenery that I already had to balance it all out. The pumpkins came in packs of three so I put one on top of a candle stick holder. I found that at At Home for $7.99. The mini-straw bale ($1.99), candle ($7.99) and lantern ($19.99) were also great finds at At Home. 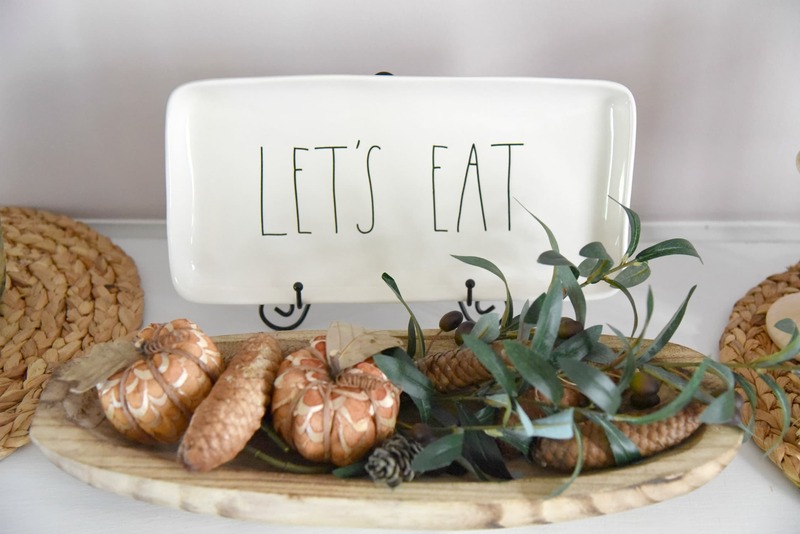 I have had this Rae Dunn Let’s Eat platter for about a month now and wanted to display it. At Home had a very inexpensive plate holder ($2.99) that made it easy to showcase it. 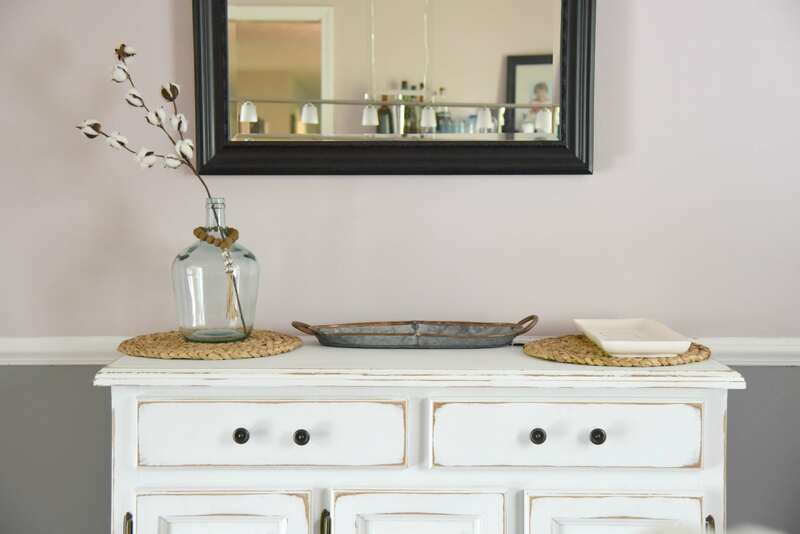 It is perfect for our dining room farmhouse decor! 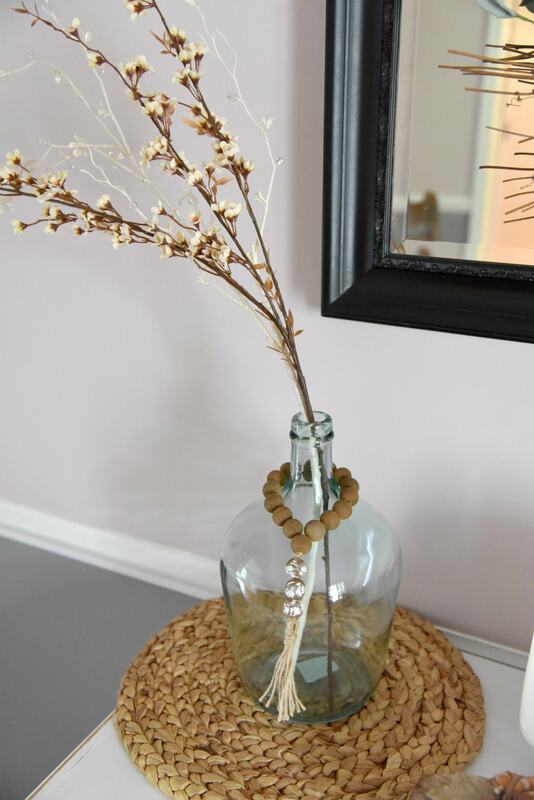 The finishing touch was to swap out the cotton stem I had in my glass jug to a more fall-friendly flower. At Home has a large selection of greenery and I found both these stems there. 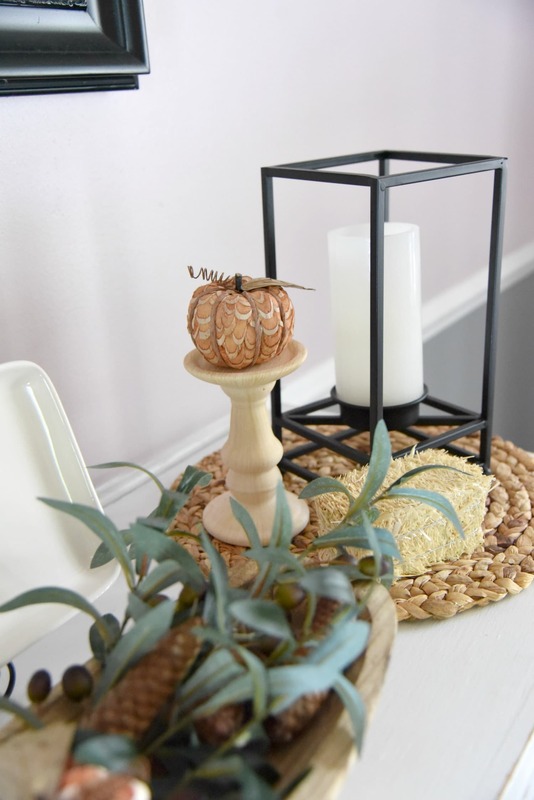 The white sparkle stem is going to look great when I swap out my fall decor for winter decor in a few months. I love finding things that can do double duty for me! 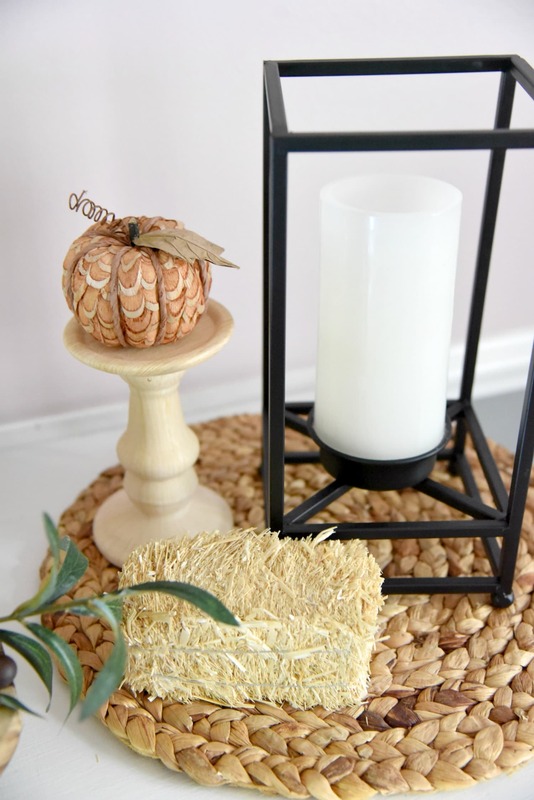 Overall, I am please that I was able to decorate my dining room for the fall for under $100! I can’t wait to head back to At Home for my winter decor shopping! To locate an At Home store near you use this store finder and be sure to follow the hashtag #AtHomeStores for more inspiration! What are some fun ways you decorate for the season?